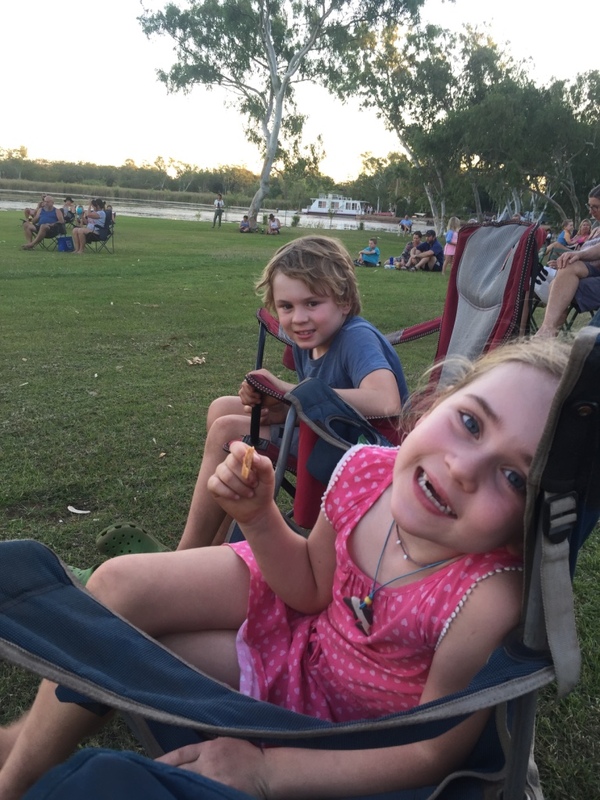 We arrived at Kununurra planning a quick stop over but ended up staying four nights so that the kids could enjoy the pool and Andrew could address some work. Reality catching up with us! 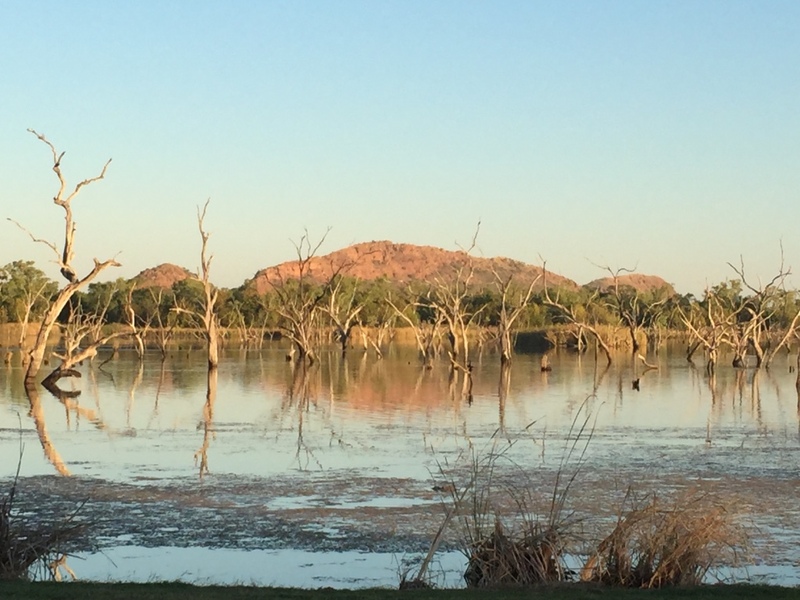 Kununurra was established in the 1960s when the lake Kununurra was dammed and when they were building the Lake Argyle Dam. 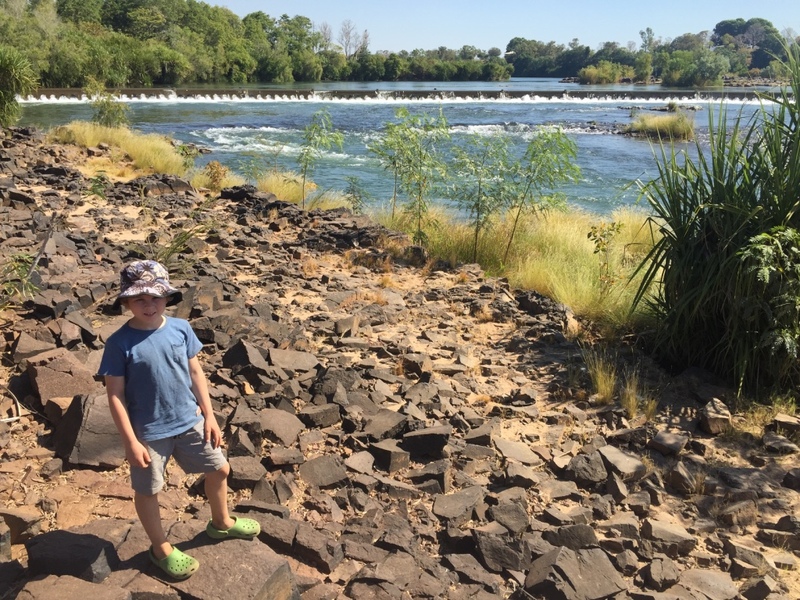 Both dams were built to capture the fresh water flowing out of The Ord River system for use on farming irrigation. 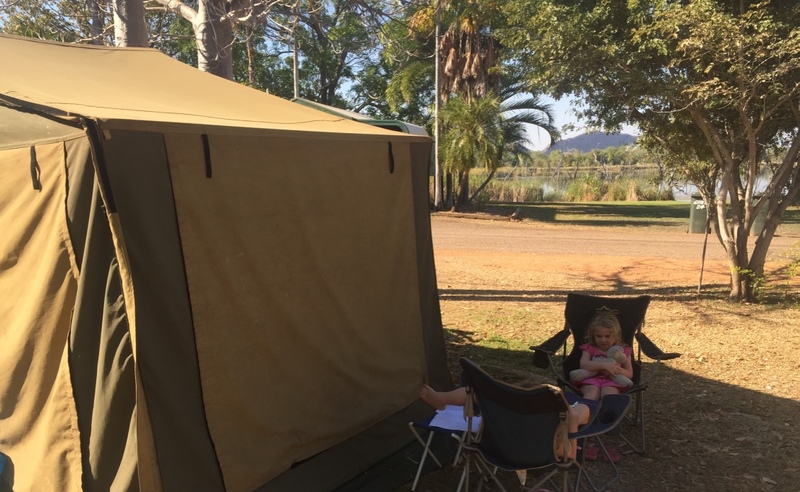 We chose to stay at Kimberley Land Caravan Park most due to referrals from other travellers and it was a great spot next to lake Kununurra a man made lake. 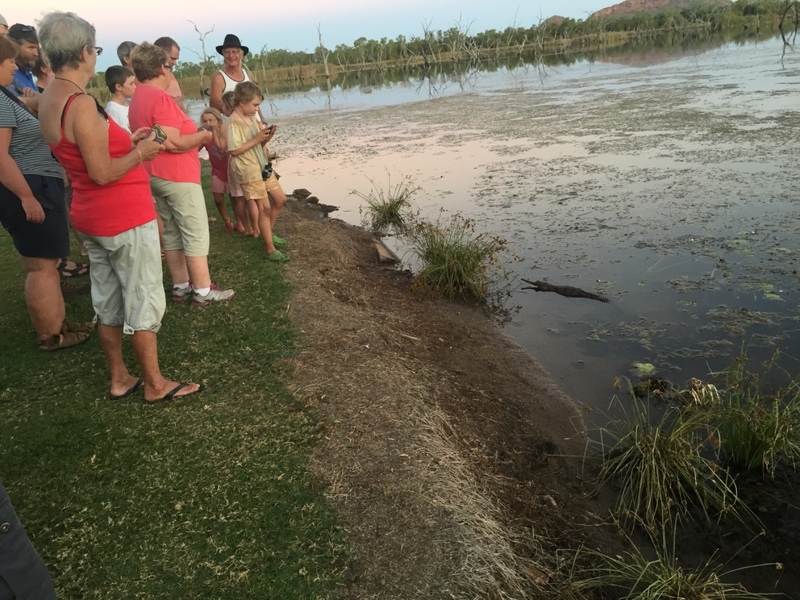 We were told there are Freshwater Crocodiles in the lake and whilst we were there one came to the lake edge and drew quite a crowd of campers. We had this view every morning and night. The rocks in the distance are called the resting Budha – because it looks like Budha lying down. From here we visited a Sandalwood Farm Factory we had noticed the sandalwood plantations on the road into town. We also visited an Art Gallery where they carve a local rock called Zebra Rock thought to be thousands of years old. 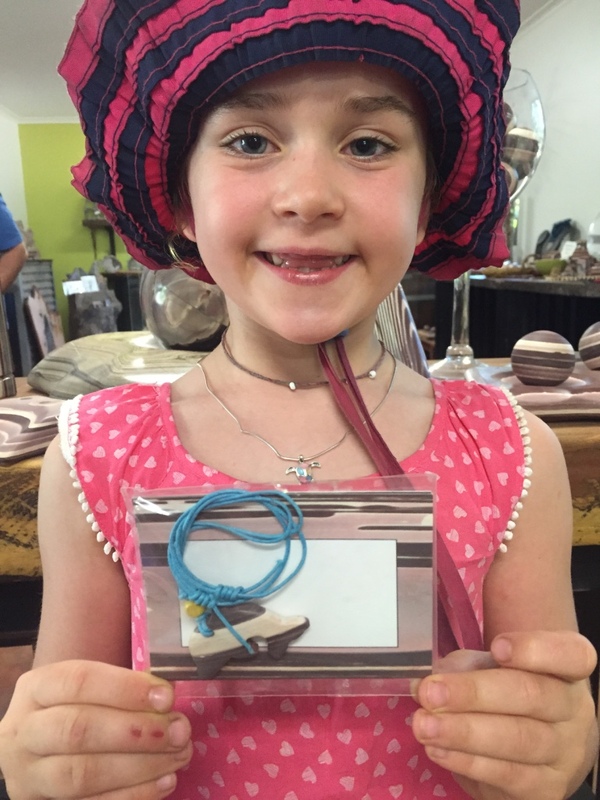 This provided an opportunity for the kids to spend some pocket money. 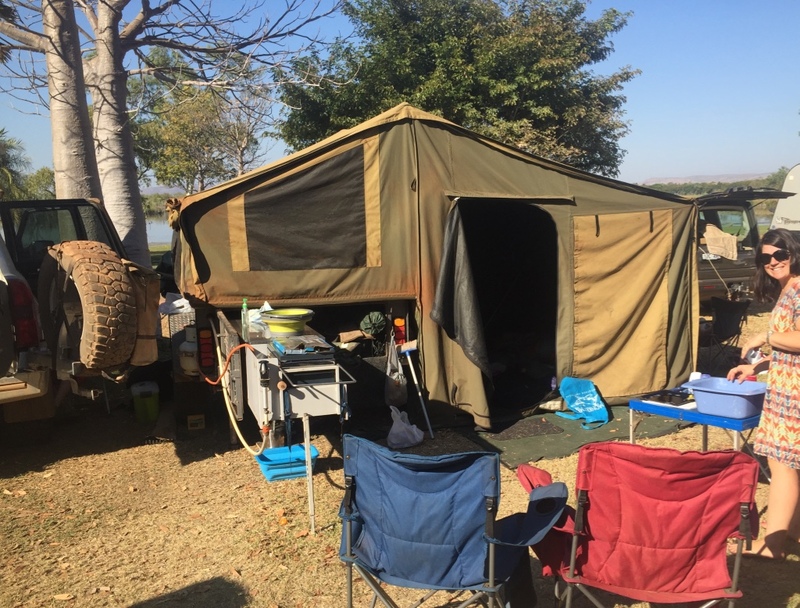 Whilst in Kununurra it was really hot (35’C or higher) and by 9am campsite was unbearable as the sun was burning hot and not a breath of wind. Luckily the pool was freezing cold in fact too cold for Aaron who only dipped in and out. Whilst we were suffering in the heat we heard reports of freezing weather in Melbourne and snow falling all over Tassie. 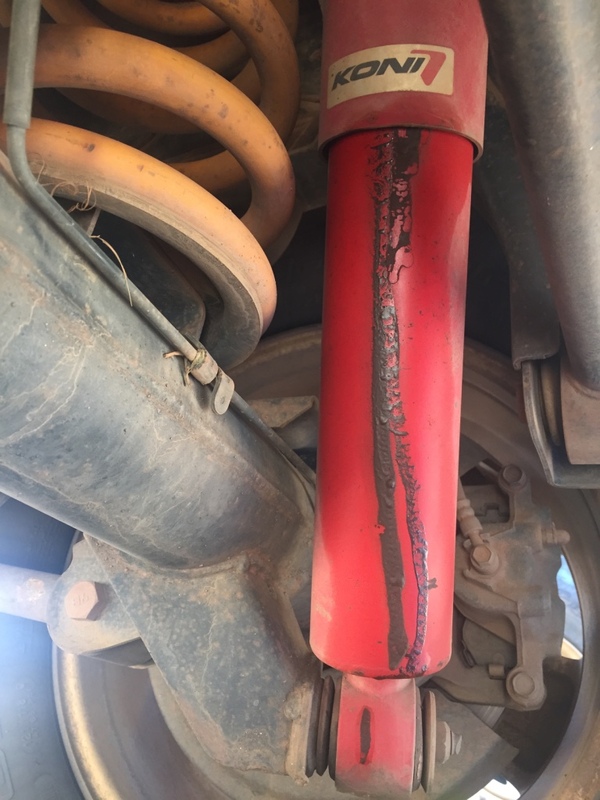 Whilst in camp eating lunch Andrew spotted some oil leaking out of the shock absorbers (never a good sign)…the corrugations and heat having some impact on the Koni shock absorbers…we made a few calls to get them checked in Darwin. 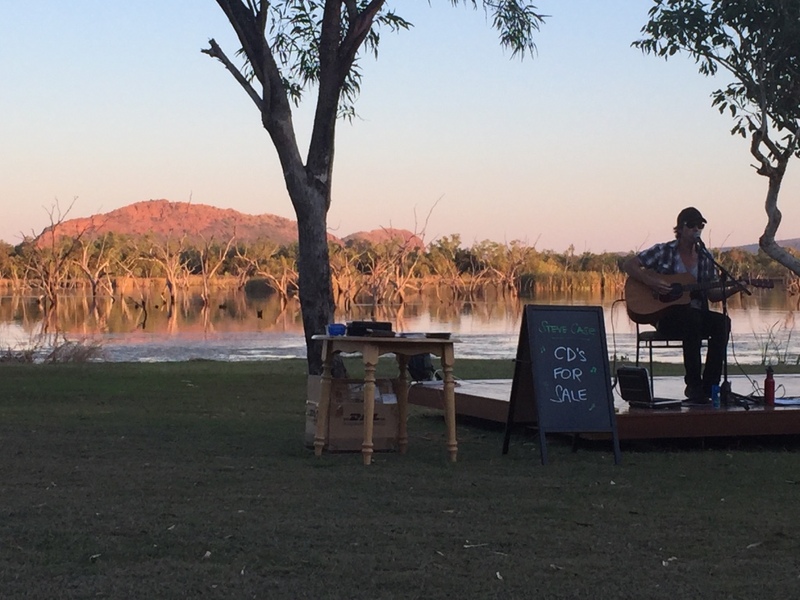 On the Friday evening whilst were staying they had a singer, Steve Case playing guitar down by the lake so we took our chairs over and enjoyed the entertainment. 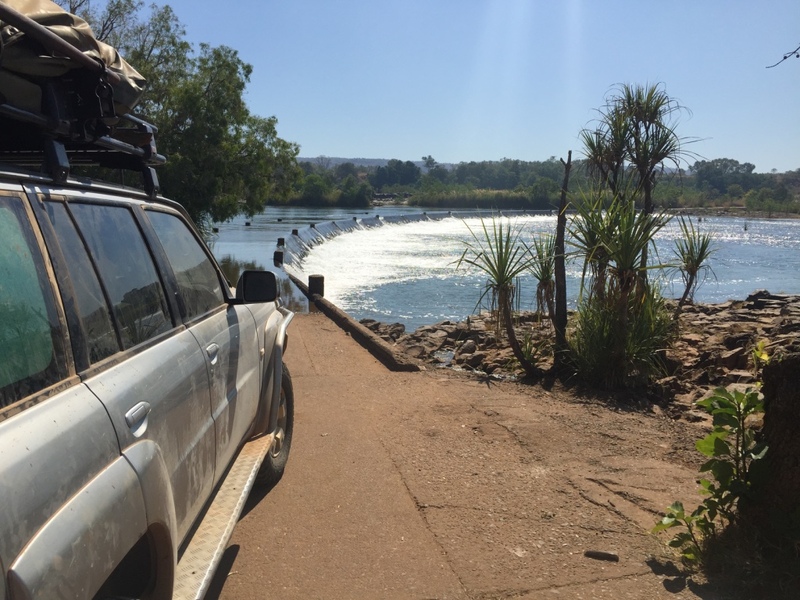 The original route into Kununurra required crossing the Ord River over a causeway crossing…which can be quite exciting with saltwater crocodiles and sometimes high water…unfortunately the crossing has now been closed as the safer alternate bridge has been built. We went down and had a look and ate lunch by the river. 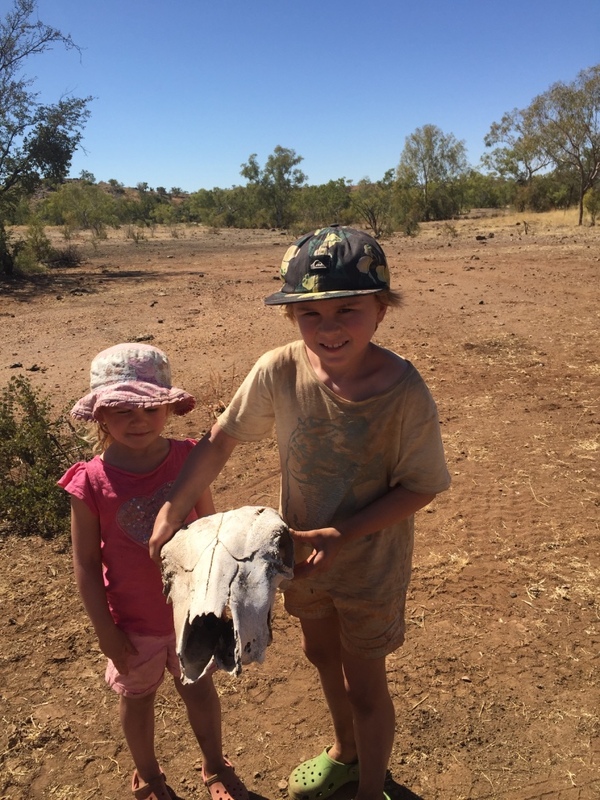 After our few days in Kununurra it was off and onto the next adventure our last stop in WA. 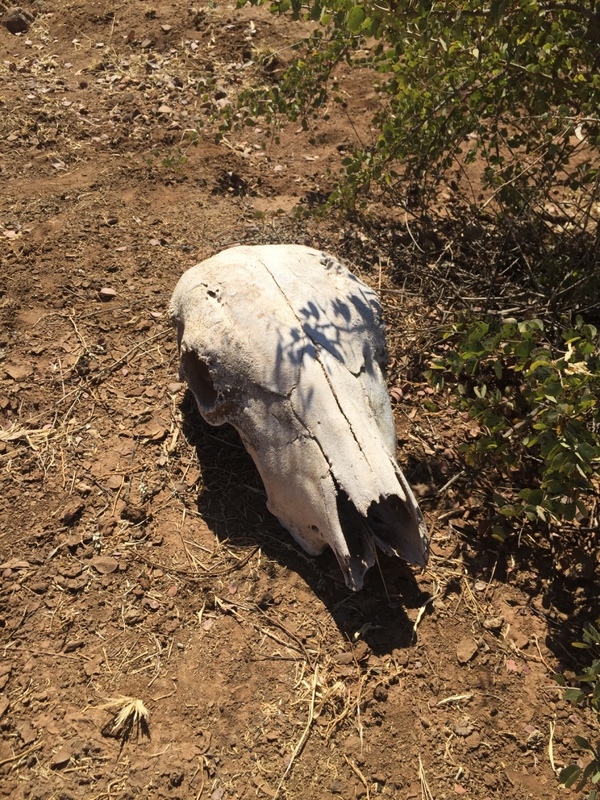 We packed up to head off to Lake Argyle and on the way out the gate bumped into Stuart and Judy again and heard a harrowing tale of Stuart having his appendices removed in Kununurra! 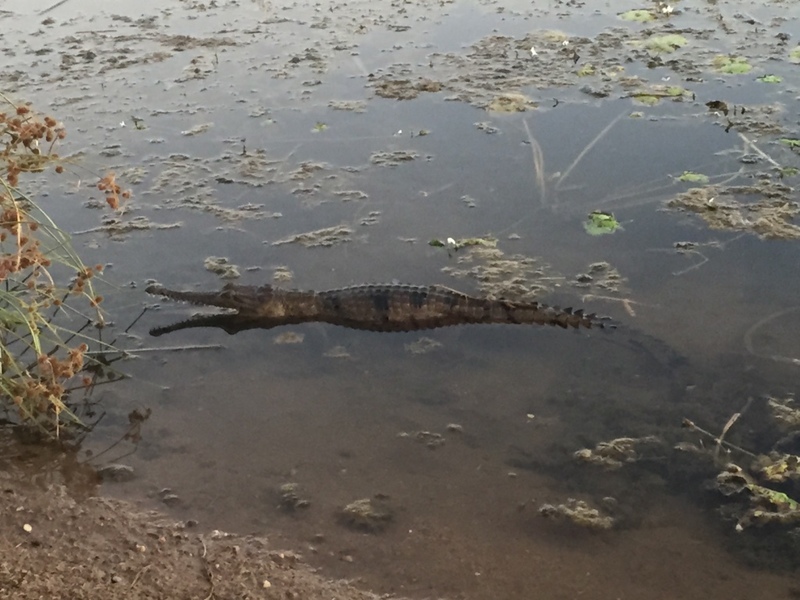 Turns out the sore tummy was serious we were glad he is okay and amazing to have such great healthcare in the middle of remote outback W.A.